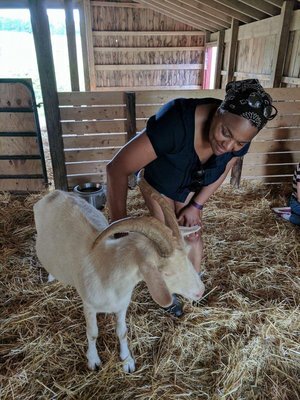 Michelle hanging with a rescued goat the famous “Farm Sanctuary” in Watkins Glen, NY. People who know me and work me know I'm ALWAYS smiling. I had a lot to smile about. I had great friends, a family that loved me (even with all their various levels of “cray-cray”), I’d opened for and shared the stage with my childhood idol, Dr. Maya Angelou. I’d also opened for and shared stages with The Dalai Lama, Howard Zinn, Mos Def, Amiri Baraka, and Nikki Giovanni. I was in a global women’s service organization, Delta Sigma Theta Sorority, Inc.
I’d received praise and recognition from Oprah for my fundraising efforts for one of her favorite charities, CAMP C.O.P.E., which provides support and resources to children with families in the U.S. military. I’d attended some of the world’s most prestigious colleges and universities, many on full academic scholarships that I’d been researching since I was about 10 years old. I’d won numerous awards, received international praise for leading meditation at a global business conference, I’d been my college’s Commencement Speaker. But it still didn’t feel like ENOUGH. I still didn’t feel accomplished enough. Even in life's lowest moments, I tried to find joy. But deep down in my gut, I wasn’t happy. But I used to only be smiling only the outside. I used to look happy but not FEEL happy. Secretly, deep inside, I was struggling with depression, anxiety, and PTSD. Years of high-stress, mostly desk jobs, eating at odd hours, and not moving enough, after years of being athletic, all took their toll. I felt disgusted with myself for “forgetting I was an athlete.” Of course, it’s counterproductive to not be kind to yourself, it only leads to more suffering. As a survivor of many waves of abuse, assaults, and traumas, I was going to talk therapy and taking antidepressants. They were good, advisable treatments, and they helped quite a bit, particularly the therapy, but the drugs weren’t working. They made me even sadder. I clearly needed more than medication. My friend Susan, now a world-renowned mosaic artist, recognized back then that my eyes didn’t match my smile and she recommended that I both receive Reiki and later train to be a Reiki Healing Practitioner. That was in the year 2000. How was this “hands-on” energy healing from the Universe (God, Light, Truth) also known as “spiritually-directed Life Force Energy” going to do any good? But after the first session, I had a breakthrough and most of my anxiety lifted. The clouds were gone and so were my blues. Once I received Reiki and learned how to truly Meditate (by not clearing my mind, but by paying attention to my thoughts), my life changed. I learned how to live authentically and to make sure that when I smiled I was TRULY happy. I stopped taking prescription drugs for good. Now mind you, I don’t think medications are ‘bad’ - as many people need them to survive. I just believe that we have a strong, vibrant self-healing power that allows us to move more and eat better - surefire cures for most of the world’s ailments! But I’m not naive, nor do I preach that others should not take prescribed drugs. Far be it for me to do that! That would be irresponsible. I partner with many progressive doctors in my position, and many wish their clients would get well so they could take fewer drugs! I see my role as encouraging people to see their doctors, explore alternative care, and to get as healthy as possible so you won’t need to rely on big Pharma and all of the negative side-effects caused from taking those medications. Through learning and practicing the ancient, Eastern healing art known as Reiki, I was able to transform my life and the lives of thousands of people around the world, through hands-on and distance healing. By moving slowly through the teachings of two intuitive Masters, I went on to become both a Usui Reiki Master Teacher (Level Four) and a Karuna Reiki® Master Teacher from the International Reiki Center for Reiki Training. Karuna is a Sanskrit to mean any “compassionate action” that is taken to diminish the suffering of "compassionate action." When individuals experience enlightenment, they report that all beings are known as one. Therefore, it is natural to extend compassionate action or Karuna to everyone without distinction because we are all one. I’ve been given the gift of being asked to be present with people in the most significant times of their lives: high-risk pregnancies, births, reliving childhood traumas, new parenting, body issues, cancer diagnoses, relationships ending, grieving families at the deathbeds of beloveds, officiating marriages, and during every cycle of life in-between! I never felt more balanced, more centered, or organized. Even with all the traumas often swirling around me, I knew it was my calling to be there and present. Instead of feeling drained by the work, it made me feel alive and authentically happy to be present with others in their times of need. But some addictions, like being addicted to achievement and ‘being constantly in motion,’ are hard to break. During this time, I met a nice person at a dinner party. We chatted together all evening. Before the night ended, he proposed. It was meant to be a joke, like, we’re getting along so well, let’s get married. Three years later we got married. That same year we got married we bought a house. Two years later, I ran for local office and won a seat on Ithaca’s City Council AND was elected by my peers on Council to also serve at Alternate Acting Mayor for the City of Ithaca. The Mayor asked me to also be in charge of the Budget, HR, and Finance Committee. Sure, why not? That’s one of the most influential committees and back then I craved status and power. I also learned that as a Council rep you had to serve on several community boards, whose agencies were receiving City funding. So that meant an additional 3-4 Board commitments in addition to the other three Boards of Directors I already served on. Little did I know that my first year of a new job as an elected official would also include pregnancy! Sure, we were trying, we just didn’t expect it to happen ON THE FIRST TRY. Seriously, this kid wanted to join the world, that’s for sure. We were already in our thirties so it made perfect sense to start right away. But getting married, buying a house, and having a baby all in the span of a few years was mind-boggling. Add to the Council job, that I was also the second Poet Laureate of Tompkins County, AND I was teaching as an Assistant Professor of Public Relations at the Park School of Communications at Ithaca College, AND I was writing my second book AND I was …you get the message. I was doing WAY too much. Oh, and did I mention, I also had a marketing business to run? Some brides, when they’re walking down the aisle, might be nervous about their wedding day. I was nervous because I was ALSO cast in a play called “Proof” that was doing well on Broadway and was soon to come to Ithaca’s Hangar Theatre, where I’d been cast to play the lead’s sister. Many Council nights are late nights, running well past midnight. I missed or skipped meals. My days got longer and longer. I missed time from my newborn. Did I also fail to mention my spouse had a job in a City one hour away? Because he was a tenured professor in the Engineering Science Department, this would not be a job he’d want to give up. This would mean years of him commuting and me mostly holding the home together while he was away. I felt like we were living in two different cities, because well, we were. He took a sabbatical the first year our daughter Nina was born (oh, yes, and of course she was a month early! ), arriving at the end of my first year on City Council in late August instead of late September of 2004. I started laboring at home, with both a wonderful Douala and midwife at my side. I was excited, overwhelmed, and scared. I had spent many months practicing for a home birth. I took prenatal yoga weekly. I swam every day. I hiked. I was very fit and ready. I had no IDEA there would be that much pain and the more I ran from it, the more it hurt. Oh, and did I mention that my spouse broke his leg a few weeks before I went into labor? That meant that with a cast, he couldn’t help me in the birthing tub. Of course. I started writing a play (that I would later stage and call “Labor”) while I was in labor. Of course. You see the patterns here, right? After 20 hrs of laboring at home, we went to the hospital, because there were a few complications - like WHY IS THIS TAKING SO LONG? Six hours later with all the many JOYS of natural childbirth (save a little drug to take the edge off), our daughter Nina was born. Nina was born with jaundice, so we had to stay in the hospital, though I would have preferred to just lay with her outdoors on the bright green grass under the glorious sunlight. I thought I’d been tired before in life, but parenting a newborn involves surreal amounts of sleeplessness, fatigue, exhaustion, and sometimes confusion. How is it possible to raise a child without sleep? Yet millions do this every day. And because Nina was premature, she took time to learn how to “latch” so I needed breastfeeding coaches to assist. It was really hard at first, then when she latched, it was magic. It was also weird to have my breast suddenly become food. We ordered in. We missed the gym. I became super addicted to caffeine. I was still a perfectionist who was overextended. My diet got more and more sugary, caffeinated, and fattening. Time literally does feel like it’s flying by when you have a kid. I blinked and our daughter Nina was out of preschool. I remember the shock when we wrote the first month’s check. Our daughter’s preschool cost more than our mortgage. With the rising costs of care, the sheer math of how much more it costs to raise a child, I went back to running my marketing business and landed a big contract with our local airport, as well as some national speaking gigs. But going back to business after being out of the game, meant re-learning and re-branding. I also had to learn about social media and stay up-to-speed with the latest trends because I was still teaching undergrads and graduate students at Ithaca College. Fortunately, I’d scaled WAY back on Boards and other commitments. The days of leaving the floor during discussion so I could pump milk, or darting out of my classroom to meet my spouse in the hallway (with the baby) so I could breastfeed, then dash back inside, were all a blur. I found most of my youngish students to be completely unsympathetic to my long stares off in the distance or my constant forgetfulness. I get it, they’re paying a lot of money to have my full attention but secretly, I hoped to be a fly on the wall when they had kids one day. We’ll see how much YOU remember there buddy. I remember feeling torn between wanting to be home with the baby and wanting to keep up with work. Things felt blurry, my hormones felt out of whack, and I was still pulling late nights trying to get things into place. At some point during this time, I believe when Nina was two, I got tired of putting toxic chemicals like relaxers in my hair to straighten it. I taught myself to fall in love with my naturally curly hair and vowed to never process it again for the rest of my life. I began to eat better and thus, sleep better. I joined a great Moms group and hired someone to help me organize my business. My Council term of four years had come to a close and I decided to focus on raising Nina over running for re-election or any other office. But that wasn’t entirely true. The young Senator from Chicago was a very appealing candidate and I was tapped to run Media Relations for our County for then-candidate President Obama. The next year, in 2008, I won the female Delegate seat in my Congressional District to represent Senator Obama at the Democratic National Convention. Because I’d been a former Mayoral spokesperson and director of community relations in a mid-sized City (Binghamton) - working for both Democratic and Republican Mayors, I had experience working across the aisles and was able to shore up a lot of bi-partisan interest for Senator Obama. As everyone knows, he became President of the United States. However, as much as I’d like to have continued down the political path, I had a baby to raise and I took a much-needed respite from the political fray. It was intensely rumored that I was planning a run for Mayor of my City, but those were just rumors. Unfortunately, the downside of politics is that when you mention you aren’t doing something, people presume you are. But I truly wasn’t. I’d never run for a job like that with a toddler needing me at home. So for those next 9 or 10 years, I focused on how to be a wife, mother, and business owner. Despite all my education and training, I couldn’t prepare for this zinger. Something shocking happened five years later when my daughter was turning 10 and playing on one of our area baseball fields. Seriously? I’m a former athlete who ran all the time. Mind you, I don’t like to run, but I CAN run. This made me realize that people in my life didn’t see me move much. That winter I had to decide if I was going to see fitness as a hobby or a way of life. That winter that I made the commitment to see my workouts as non-negotiable, was a REALLY cold winter in upstate New York. Have I mentioned WINTER enough? Come hail or freezing rain, I was determined to MAKE A DECISION about my health –and weight. I could stay the same or I could change. Sometimes I need something radical to get moving. If you’re like me, you sometimes need a challenge, a buddy to partner with, or just a jolt that you’re sick and tired of being sick and tired. I entered a national fitness competition called “The Total Lean Challenge” sponsored by Map My Fitness and GNC. Nina laughed heartily because she saw me work out only when I ran my hiking club – just once a week, with nothing else in-between. She had reasons for being incredulous. But if you want to “get my goat,” just laugh at me when I tell you I’m going to do something. However, beyond wanting to prove her wrong, I wanted to be AN EXAMPLE to her about eating well, moving well and living well. I went from working out weekly – to working out EVERY DAY sometimes more than once. One evening, out in the frigid cold (on a day so cold that my eyelashes started to freeze), I felt insanely HAPPY. Yes, it was also insane to be outside but I wasn’t going to let the relentless winter stop me. And you know what? I did take FIRST PLACE in women and 3rd place overall. In less than three months, I worked out over 800 times! I went from couch potato to wearing the high school jeans that I’d worn as an athlete. I jump started and UP-LEVELED my entire life by working out more than 800 times in less than three months. Trust me, if I CAN make a radical change – so can you. Any of us can. It takes believing in ourselves and then making the change happen. It also takes support. Once my daughter saw I was truly serious, she was and remains my biggest fan and cheerleader. Now when I miss a workout, which I sometimes do, I don’t beat myself up. I don’t throw in the towel. I don’t go eat cake (like I used to). Well, wait, if I do eat cake, it’s just a piece, not several. I just get back at it. I remind myself of when I was in high school through my early twenties when I used food restriction and overexercising as tools to stay thin. These unhealthy, but popular choices, also included taking over-the-counter (and yes, sold to kids) Dexatrim that suppressed my appetite. I was remembering my either withholding food behaviors and my overeating behaviors when I went to see my Life Coach. (Yes, Coaches have Coaches, just like Dentists have to see other Dentists)! Dave suggested several exercises, including one in which I couldn’t let my pen leave the paper. I had to just keep writing “my purpose on the planet is) and answering it during this timed exercise. It was during this exercise that I uncovered that my TRUE PURPOSE was to help others reduce stress and trauma in their lives. I felt particularly drawn to helping others like myself (business owners, Type A personalities, wellness providers, business executives, people of color, women, leaders, etc). Although I loved marketing and PR and was an accomplished practitioner, consultant, and teacher I wanted to also help others live happier and healthier lives. I rebranded my company (again!) as a Health and Wellness Enterprise. I got certified in several aspects of health and wellness, including coaching. I went on to create the first ever Wellness Programs for a global business school, an award-winning school district, and to be a leading “Mindfulness Wellness Consultant” and a “Meditation Teacher” for global wellness companies, progressive corporations, leading-edge start-ups, national non-profits, governmental thought leaders, and with women’s groups, entrepreneurs, and more! With this renewed confidence and authenticity, I was chosen in a national search to represent a global wellness brand in a national TV commercial. I then fell in love with Simple Green Smoothies and was accepted as one of their Ambassadors. All of these choices and experiences bring me to this authentically happy life. AND I get to refer my friends, family, and clients to products, cleanses books, and recipes that I trust and use myself. Sure, some days aren’t great, but that is life. Since finding my truest calling, through successes, failures, fits, and starts, I have been able to touch the lives of thousands around the world. Now, this is part of a longer story, but several years ago, as a complication of catching a serious flu from a client, I almost went blind. Most recently, as in THIS MONTH, I suddenly and unexpectedly lost all my hearing in my right ear. If I didn’t have the healthy tools, the healing networks, insurance, good doctors, and great acupuncturists, other Reiki Masters like myself, talented massage therapists and chiropractors, I’m not sure if I’d have regained my sight AND my hearing, but I did. 100%. I Found My Why And I Want To Help You Find Yours. So now that you know I’m a TYPE A - PERSON in recovery from that kind of self-induced pressure, you might understand why I believe that mindfulness is TRULY the antidote to burnout. Now that you know my story of overachievement, under-eating and overeating, you may understand why I so appreciate mindfulness, meditation, reiki, and getting out in nature. I want to help busy, overworked, often stressed or burned-out visionary leaders, parents, employees, and entrepreneurs learn how to press “reset” and design lives that focus on either preventive wellness or corrective self-care. I want you to enjoy an authentically happy life filled with total wellness (more sleep, good eats, true work-life integration, and REAL BALANCE). I know what it’s like to be driven, a Type A perfectionist, a constant list-maker, an avid risk taker (the good types of risks), but to also lose your health because you don’t know how to take the type of rest and relaxation everyone needs. You might gain days of productivity from burning the candle at both ends, but you later LOSE weeks due to your weakened immune system. You can lose your health, wealth, and yes, your life to being in constant overdrive. Studies prove that by working LESS, you can do MORE. Research also supports that mindful self-care has a huge return-on-investment, and can stem skyrocketing health care costs. Happy managers are kinder to employees. Happy employees don’t take tons of sick leave and are wildly productive. Real wellness is within our grasp, yet the United States is among the unhealthiest nations in the world. The American model of healthcare is based on illness, so building cultures of preventive healthcare are of paramount importance. Preventive care improves mood, morale, and all types of wealth - spiritual, financial, social, you name it. But I know how hard it is to sift through conflicting health information. One doctor might say that blood tests and BMI means everything. Another might say that it’s not blood tests but rather the ability to sustain physical exertion and regular movement that make all the difference. Simply put, Western thinkers and medicine often treat symptoms related to illness or disease. Eastern medicine and Eastern practices, like Reiki, put more credence in understanding the root causes of dis-ease or illness. However, many people invested in healing are working to put the two together. Some of these arguments about East vs West are old. Some are new. The net-net is that you can choose between a wide variety of practices to develop a system for self-care and healing. But you must advocate for yourself AND deal with a huge amount of nonsense that isn’t true. Just because it’s on the Internet doesn’t mean it’s real or valid. In my opinion, the most important thing is to find something you can stick with and commit to it. An exercise program. A daily modification. A goal that gets you moving regularly. More and more people are realizing we are what we eat and are in step with the whole foods/clean eating movement that emphasizes healthy options that help break out addictions to sugar and processed foods. My motto is - “One Small Step Each Day, One Giant Leap for Your Health and Wellness.” I believe that in helping you find solutions to your pain means that you have to take that first step. With each new change in attitude, behavior, eating, sleeping, and moving, all things are possible. That happy, healthy, and productive life is waiting there for you. In fact, it’s always been right there waiting for you to tap in and listen and breathe deeply. Through a prevention-mindset, we can reduce skyrocketing healthcare costs that negatively impact our relationships, our lives, and our economies.